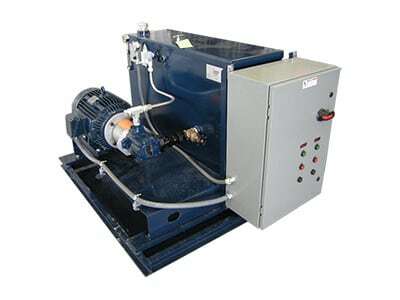 Our hose test rigs allow you to proof test, burst test and cycle test any size hose to ensure safety. From small hoses used in the automotive industry, to large, miles long umbilical hoses, we can design and build a hose test rig to meet your needs. 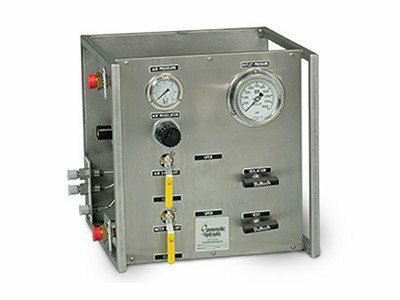 All of our hose test rigs include quality, dependable high pressure liquid pumps, gas boosters and other parts from the best brands including Haskel and Butech. Blowing out the test fluid for the hose(s). All components are mounted and plumbed in an enclosed, stainless steel cabinet, with open back, and tested prior to shipment. The left side of the cabinet has a sloped front panel containing the valves, regulators and gauges. Mounted on the side of the control section is the stainless steel test chamber, 60” long x 28” wide x 12” high, for the hoses. The chamber has gas cylinders for easy opening of the chamber lid. The lid is hinged, has latches and a small Lexan window.